They say French, I look at it and think "Sicily", but I'm no expert. Definitely Italian. I have seen similar before usually attributed to Carmelo Catania. Michael had one similar here that was branded as a Sonora. Lets not open that can of worms again, Sonora was a retail brand (NOT a luthier) and certainly had some made by Busato, some by Catania, and probably Jacobacci and who knows who else. It is known that Catania, Di Mauro (Antoine) and Jacobacci were close friends and probably co-operated occasionally, and the shape of that one has some similarities to Di Mauro but it is certainly NOT out of the same mould as the regular Di Mauros. Some 'experts' have claimed the Sonoras with a 13 and a half fret join to the body were made by Busato, but the more common 12th fret models could have been made by anyone. I would suggest the same with this one. The fancy pickguard and the tailpiece I have seen before and certainly point to Italian origins. Also, even with cash burning that hole - I know, I have been there too - just remember that if times get tough later on and you need to sell it, there is so much BS and snobbery in the GJ market that a guitar without a name, however good it may be, will only ever be a cut-price curio. 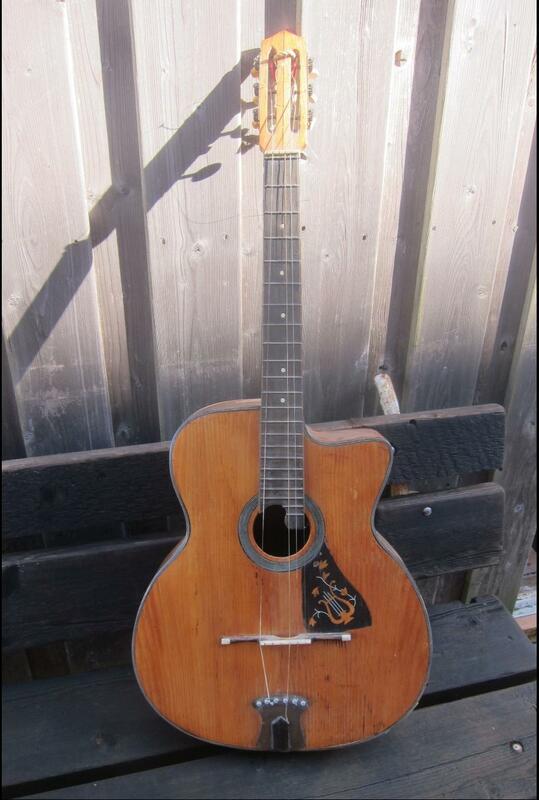 What would otherwise be a $500 old guitar at best, of course then becomes worth thousands if it has the right label but if you can't positively identify this one it needs to be very cheap. Having seen Palm's ads before I doubt that will be the case AND it states it needs 'repairs'. Yes, I had seen that one. That also looks very much like the Italian style, (patterned pickguard, inlaid bridge, three piece neck) again possibly Carmelo Catania and appears to be in good condition and a fair price although I don't see why they think it dates from 1920. 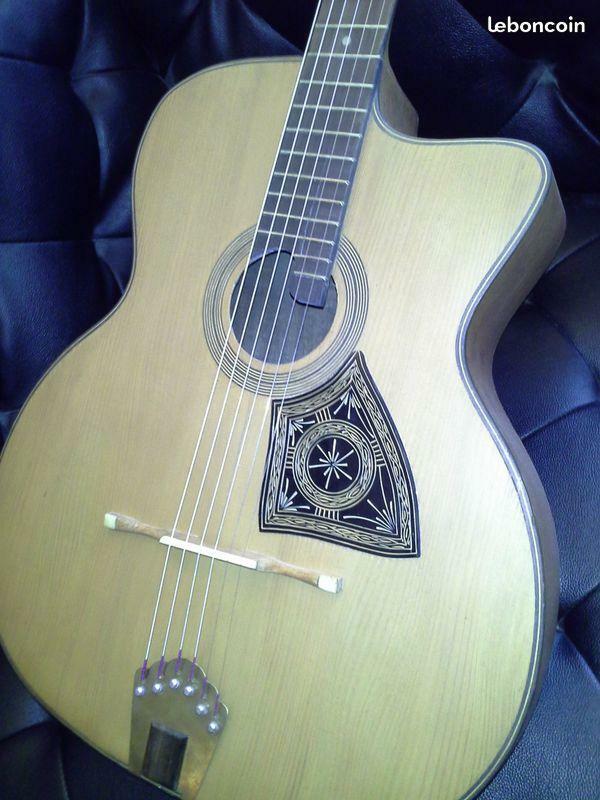 It is also possible that, as with the Sonoras mentioned previously (and Symphonia, Musikalia) that guitars decorated in this style for the Italian market were made in France. Certainly the Busato factory made some similar, but before anyone thinks "hah, Busato; I have struck gold" bear in mind a large number of mass-produced Busato guitars were sub-contracted out to Pierre Fontaine. It looks like it could be a nice guitar with a 'difference' and certainly worth considering over any of the Asian made guitars in the price range. It is advertised as 'no postage' so if you are up for a drive from Glasgow to Paris, the seller is just south-east of there and not far from Samois if you need an excuse to visit. "guitare manouche ancienne". Some nice pictures. 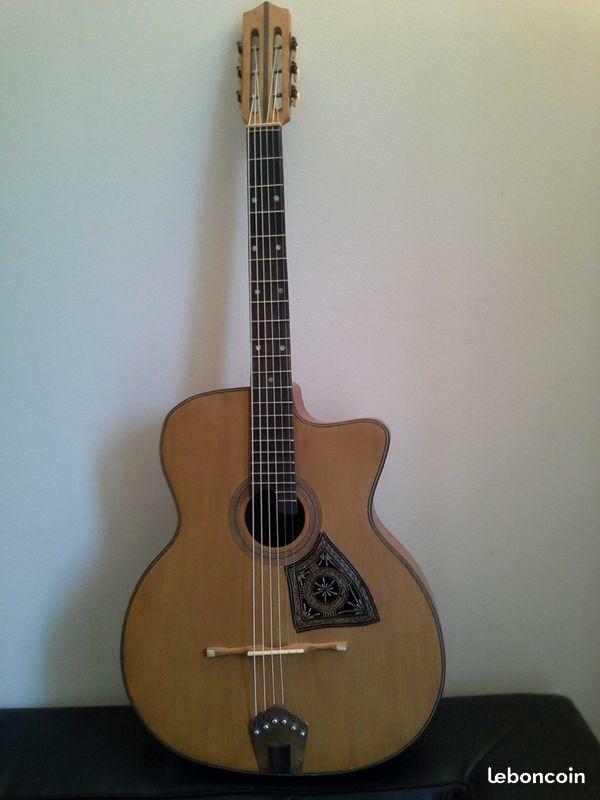 It looks in good condition and apart from having no name and no 'S' in the tailpiece identical to my Sonora. Some were sold with the Jose Sanchez or Loisellet Gaillard labels (as mentioned on a previous thread) and others with no obvious branding at all; but definitely all from the same source. Some prefer to believe they came from the Busato workshops and why not, they are good loud guitars anyway. Common distinguishing features are the very curved back with no bracing, three piece neck and a neck to body joint just above the 13th fret. I am still hoping someone comes up with definite proof of their origins one day as they are nice guitars but most folks prefer to hang their dollars on a known 'name'. At that price it is worth investigating.